Vast amounts of 3D XPoint memory, always loaded and ready to go, represent a fundamental change in how PCs handle data. One day, if Intel and Micron's new 3D XPoint memory plays out the way I expect it to, you'll never have to wait for another game or app to launch ever again, because they'll always be "loaded." That future hinges on a lot of changes to the PC itself, but the first building block was announced Tuesday morning in San Francisco by Intel and Micron, in a technology called 3D XPoint. Let's not get too caught up right now in the technical details of how this 3D stacked memory works. It's a 20nm process built in a Utah fab jointly owned by Micron and Intel, a fab that took 10 years and untold riches to make. It's complicated stuff. Just think about what 3DXPoint could do to our computing experience as a whole. In today's desktop, laptop, tablet or phone, you have main memory or RAM that's counted in megabytes, and storage that's typically counted in gigabytes or even terabytes. RAM is immensely fast, but once you cut power to it, it forgets everything. Your hard drive or SSD stores gigabytes of documents, pictures and movies when off, but it's many magnitudes slower than RAM. 3D XPoint is the first breakthrough in memory in 26 years, Intel and Micron say. 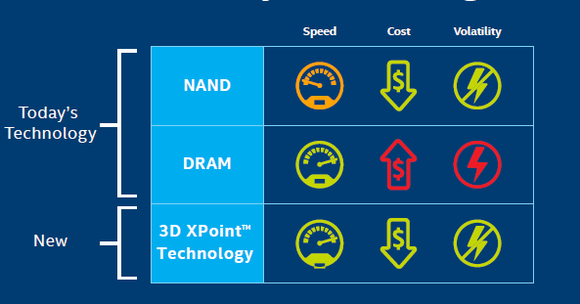 3D XPoint sits in between those existing technologies. 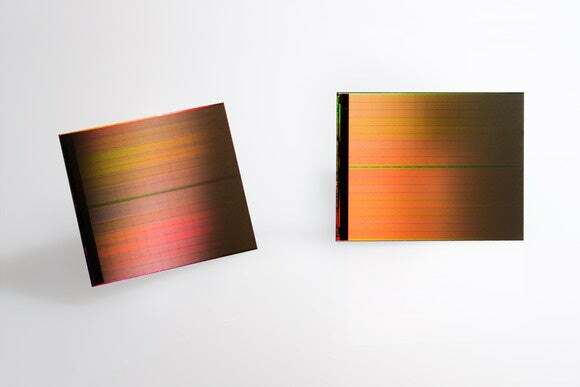 Per Intel and Micron, it's 1,000 times faster than an SSD and 10 times denser than DRAM. It's also non-volatile, which means there's no need to power it. Because system RAM is relatively low-capacity compared to an SSD or hard drive, only the data you need is loaded into RAM before you can use it. With 3D XPoint's DRAM-like speeds, there's potential for a PC of tomorrow with 1TB of 3D XPoint to have a computing experience as though everything on your SSD or hard drive was loaded into main system memory all the time, without a power cost. Think about the ramifications of that for a second. You'll never have to wait for anything on your PC, laptop or tablet to open. The CPU won't have to load the picture from the SSD or hard drive. With 3D XPoint it's already there, in a state as though you had it open already. 3D XPoint offers RAM-like speed with SSD volatility and capacity. Remember, 3D XPoint isn't a new NAND technology or RAM. It's something completely new. 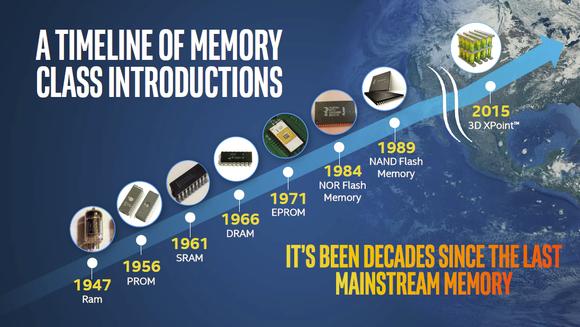 If a system has 3D XPoint as its "main memory," everything is just "open all the time." Intel and Micron execs even intimated that such a configuration, without RAM, was possible one day. Much of that possibility hinges on the actual performance of 3D XPoint. Intel and Micron didn't get into specifics beyond the "1,000X" faster switching speed, but they did say 3D XPoint would offer "10X" the performance of an NVMe PCIe device. You don't have to look far to find that NVMe PCIe device either: The only one I know of today is Intel's excellent 750 series SSD, which hits in excess of 2.5GB of read speed on some loads. If that is the drive both companies are using as a reference, it's pretty easy to see that they expect 3D XPoint drives/devices to reach beyond 20GBps of read and write speed. For reference, a typical PC with a Haswell or Broadwell CPU and dual-channel DDR3 offers around 17GB+ of memory bandwidth, while lower-end machines survive on 9GBps or less. Higher-end systems reach into the 55GBps range, while graphics card memory far outstrips those. 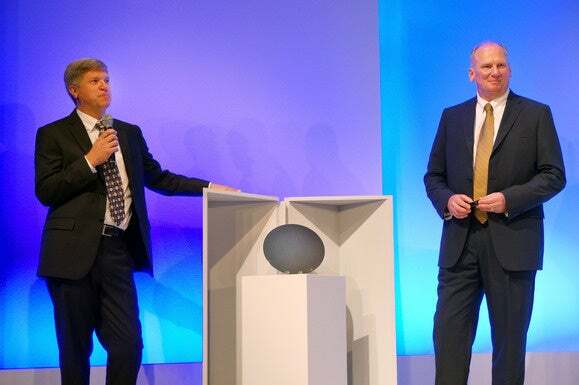 Intel Senior VP Rob Crooke and Micron CEO Mark Durcan stand next to a 3DXPoint wafer. 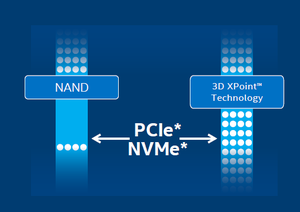 3D XPoint sounds amazing, but there are a lot of 'ifs' between here and there. First, today's PCs just aren't architected to have terabytes of storage that run at near-system RAM speed, nor is there an easy way to get it close enough to your CPU. If 3D XPoint is as fast as Intel and Micron claim, there won't be enough bandwidth for it to live alongside a GPU in most systems today, either. Then there's the OS. As far as I know, Windows isn't designed to have a device that offers near-system memory speed while acting like a storage device. I'm no OS nerd, but Windows still works on the bifurcated world of main system RAM and storage devices. Such a world won't exist with 3D XPoint. That means initially 3D XPoint will likely be packaged into the familiar models we understand: In M.2 or PCIe cards initially, when introduced probably next year. They'll be wonderfully fast and push us to the limits of those interfaces. But the real end game for 3DXPoint could be a fundamental change in how we compute. At this point, any conjectures about 3D XPoint are based on a short press conference, and reading between the lines of what I think the execs were hinting. The reality is many years away, so don't toss your DRAM or SSD just yet. Graphics technology lives and dies by memory bandwidth, and 3D XPoint just won't cut the mustard, period, for graphics loads. People also aren't taking fewer photos at lower resolutions. We're going to need bulk storage for the foreseeable future, and that's going to come from SSDs and even hard drives. Still, it's quite possible that in a few years, your typical consumer PC will have nothing but a 3D XPoint device. When off, no power will be consumed, as 3D XPoint won't need power to refresh it like today's LPDDR3. And when you go to start up your browser, Photoshop, or yes, even Adobe Acrobat, it'll snap on almost instantly, because it was never really ever "closed." Sounds crazy, right? But it's close to being true.